Yesterday was a putter day. Hubs was involved in a pretty big construction project in the living room. I've been a bit under the weather. And so Spud and I tried to keep ourselves busy, close to home, in the other half of the apartment. I played cars with him, of course. But I'd go nuts doing that all day. And we did go for a swim for a couple of hours in the pool. After awhile though, I was itching to get some stuff off my to do list. And then it occurred to me. 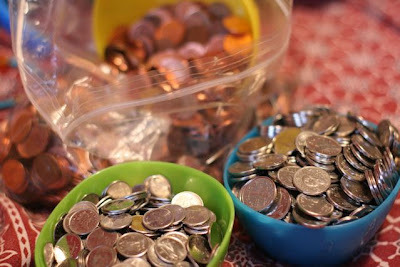 Why don't I get him to help me sort out the bucket of change in our dresser drawer? And what fun it turned out to be. And talk about 'teachable moments'! It wasn't until I converted the value of the various coins into toy cars that he seemed to really grasp what we were doing. 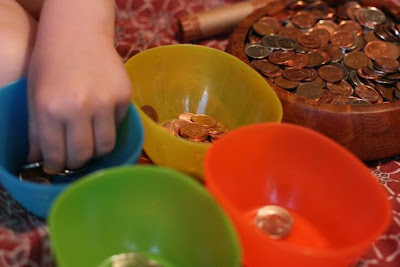 Once he figured out that 3 rolls of pennies could buy him a Hot Wheels, he was all over the project and he turned into a little bank manager, sorting, directing, encouraging me to go faster [or was it bossing? ], counting the rolls over and over, delivering the rolls to various 'safe places' and even filling up some rolls himself. I can see this being a favourite activity. I just don't know how to break it to him that we are not spending all of it on toy cars. Just in time as there is a move afoot to discontinue the penny as a cost saving measure. Bean counting will never be the same without them will it.